The only seat you’ll ever need! 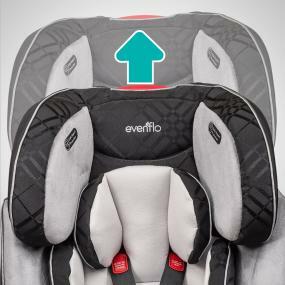 The Evenflo Symphony LX All-In-One Car Seat features Quick Connector Latch, quickly and safely attaches and detaches the car seat from the vehicle with one hand! The Infinite Slide harness easily slides to adjust for an accurate fit every time with no rethreading necessary. Easy in and out for your child. Easy pad removal for you. The Symphony All-In-One allows extended use from birth to booster mode up to 110 lbs. Designed and tested for structural integrity at energy levels approximately 2X the federal crash test standard. Designed, Engineered, Tested, Molded and Assembled in the USA. 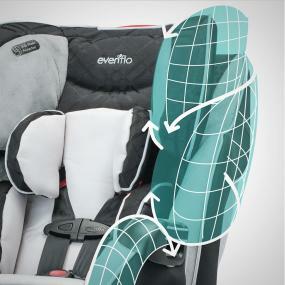 Our #1 priority is safety – All of our Evenflo car seats are side impact tested. Meet or exceed all applicable federal safety standards and Evenflo’s side impact standards. Child restraint is designed and tested for structural integrity at energy levels approximately 2X The Federal Crash Test Standard. FMVSS 213: Federal Motor Vehicle Safety Standards for Child Restraint Systems. FMVSS 302: Federal Motor Vehicle Safety Standards for Flammability of Interior Materials. Certified for use in aircraft: This child restraint meets FAA Inversion requirements for airplane use. 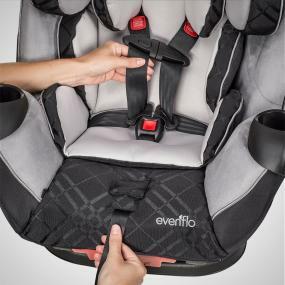 Evenflo temperature testing: All current Evenflo car seats are tested for product integrity at both high and low temperatures. 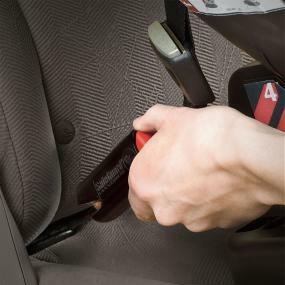 Quick Connector Latch – Quickly and safely attaches and detaches with one hand! e3 Side Impact Protection significantly reduces side impact crash forces up to 50% through an expanded zone of protection and 3 layers of superior protection. All-In-One Car Seat – The only car seat you will ever need! Infinite Slide Harness easily slides for an accurate fit every time. No reworking the harness as child grows! Up-front multi-position recline for child’s comfort while asleep or awake. 65 lb. harness weight rating accommodates growing children longer. Removable head and body pillow for additional comfort and support. One-hand adjustable headrest grows with your child. Integrated cup holder for easy access to drinks. 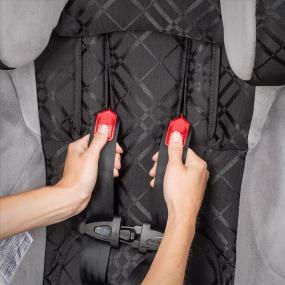 Easy-off, machine-washable car seat pad requires no harness rethreading. Designed, Engineered, Tested, Molded and Assembled in the USA. 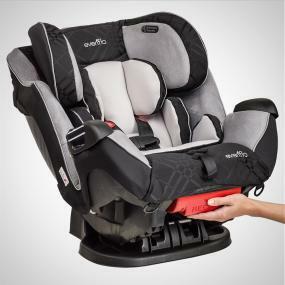 Rear-Facing Requirements: Weight: 5 – 40 lbs (2.3 – 18kg), Height: 19 – 37 inches (48 – 94 cm), and Top of child’s head is at least 1 inch (25 mm) below the top of the child restraint seat back. Forward-Facing Requirements: Weight: 22 – 65 lbs (10 – 29.4 kg), Height: 28 – 50 inches (71 – 127 cm), the tops of their ears are below the top of the child restraint headrest and at least one year of age. Booster Requirements: Weight: 40 – 110 lbs (18 – 49.8 kg), Height: 43.3 – 57 inches (110 – 145 cm), the tops of their ears are below the top of the child restraint headrest and at least four years of age.